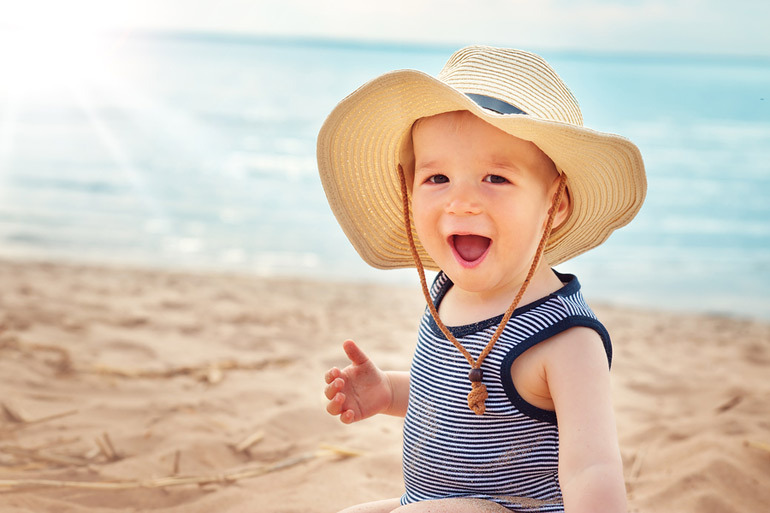 Whether you live for the beach, crave the city or prefer the quietness of the outback, these Aussie baby names are too cute not to consider! We’ve combed the Australian shores to discover some of the sweetest sounding cities, towns and communities to name your wee one after. You may have noticed that geographical baby names are so hot right now. Victoria and David Beckham opted for Brooklyn for their son (with countless following suit). Nick and Vanessa Lachey selected Camden for their son. And, most recently, Kim and Kanye West decided on Chicago for their third child, a little girl. While there are heaps of cute American city baby names (Boston, Austin, Dallas, Nevada, Kennedy, to name a few), we reckon the cutest names hail from Down Under. Sure, there’s the obvious ones, like Sydney, Victoria, Adelaide and Darwin, but step off the beaten track and you’ll uncover even more hidden Aussie gems. 1. Alvie – The new-age variation of Alfie or Albie (Albany), Alvie is a small town in Victoria. 2. Bowen – Known for their mangoes, Bowen is a seaside town in Queensland. It also makes an adorable name. 3. Coen – Way up north you’ll find a little town called Coen. If you like unique monikers, this one might float your boat. 4. Cadell – Not just the name of one of Aussie’s most-loved cyclists, Cadell is also the name of a little community near the Murray River in South Australia. 5. Logan – One of the bigger cities on our list, Logan is located near Brisbane, Queensland. It sits in the 41st spot on the most popular boys’ names of 2017. 6. Hunter – Another trend-setter, Hunter is a nod to the Hunter Valley in New South Wales. It is currently #20 on the boys’ most popular list and also gaining momentum for little girls as well. 7. Yarra – Another Valley-inspired name (or river-inspired, if you’re from Melbourne) Yarra is a unique choice that also pays homage to Game of Thrones. 8. Bronte – Pretty and poetic, Bronte pays homage to the picturesque Bronte Beach in Sydney. 9. Elan – Short for Elanora, a Gold Coast, Queensland suburb. 10. Tasman – Short for Tasmania, Tasman is often considered a surname but it also works for a first name too. 11. Agnes – Agnes Falls, Agnes Heads, Agnes, Victoria. All beautiful, just like the name. 12. Greta – Another vintage classic, Greta is a rural distract in Victoria. It also happens to be where Ned Kelly once lived. 13. Ara – Short and sweet, Ara is a cute shortened version of Araleun, a small town in New South Wales. 14. Airlie – Bold and breezy, Airlie is a beautiful beachy-name for either a boy or a girl and pays tribute to Airlie Beach in Queensland. 15. Emerald – If you like colour-inspired names, then Emerald might tickle your fancy, named after a mining town in Queensland. Or, you could go with Indigo after the Indigo Valley in Victoria. 16. Zanthus – Fan of the Z names? This striking option is sure to turn heads. Zanthus is a remote community in Western Australia but also means ‘golden haired’ in Latin. 17. Benin -Located in Western Australia, we love this funky alternative to Benjamin! 18. Lynton – If you like the ‘ton’ names (Paxton, Quinton, Ashton, for example), then you may like this unique choice, which is also a town in Western Australia. 19. Ariah – Aria (minus the h) continues to climb the trendsetting charts across the globe. Add an h to the end and you’ve got an Aussified version. Ariah is not only a great name but also a park in New South Wales (Ariah Park). 20. Riana – Another Tassy gem, Riana is a little-known community that doubles as an adorable name. 21. Marlo – Strong, yet sweet, Marlo is another beautiful option for bub, the name of a small village in Victoria. 22. Avalon – Ava is one of the most popular names for little gals across Australia, but what about Avalon? It’s unique and pays tribute to Avalon, Victoria. 23. Allora – Another elegant A name, Allora is a town in Queensland. 24. Jericho – Named after a town in Outback, Queensland, Jericho is a delightful choice for either gender. 25. Elliot – We’ll end our journey in the Northern Territory’s small town, Elliot, which is another unique unisex moniker. If you want to steer clear of the geographical baby name motif, then here are a few other baby names often associated with Australia. 26. Billie – The Jolly Swagman had one of these, you should too. 27. Matilda – No explanation needed. 28. Tilly – See above. 29. Jarrah – Named after the popular Aussie tree. 30. Reef – You know, The Great Barrier… Or, you could go with Coral for a girl. 31. Clancy – …Of the Overflow. 32. Banjo – See above. 33. Jack – It’s been one of the most popular names for Aussie boys for generations and continues to dominate the charts today. Plus, it pays homage to the Union Jack in our flag. Doesn’t get any more Aussie than that! 34. Joey – Or, you could go with Boomer. Looking for more baby name goodness? Check out these footy-inspired baby names and these brilliant boozy baby names worth a toast!